Thank God It's Friday and - almost - the release of the best TV show ever. But let's start with another kind of shows - those that have been released this week, including the luscious Anna Polina and the first show of Lilu Moon! Long time no see! 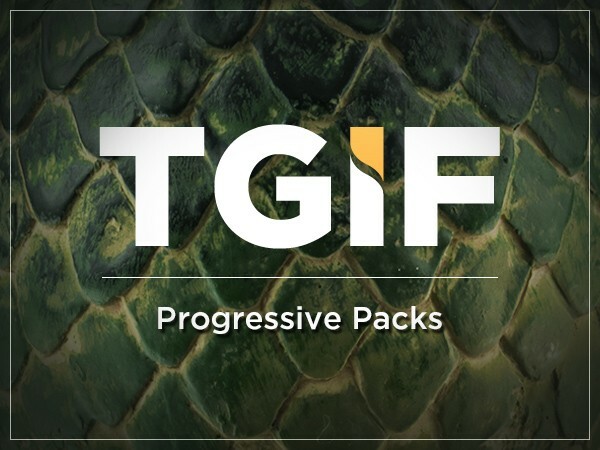 Previous progressive pack was 3 months ago! Time flies guys. The first discount starts at 20% off and it goes up to 56%! How to get your packs? Promo ends on Friday, April 12th (9AM GMT+1). Who is that dressed as Daenerys in the progressive packs? y est trop médiocre avec un énorme scintillement (flickering). C'est dommage car la miss a l'air plutôt bien, on verra sur les suivantes. et de plus en plus de problèmes de définition sur les cheveux. do you need to buy all the eggs for the Game of Throne show? Excuse me, but what is this 'best tv show ever'? Non-alternative "Progressive packs" are not good. I don't want to buy half the proposed shows, even at a discount. Next time just add the option to re-roll show sets for credits. I just bought all of the packs, thinking it would give me an exclusive card with Bonnie Parker. Couldn't be more wrong, no card was given. The only cards you get are the ones from thhe pack, at a smalll discount increase. And in my case, most of the cards were 720p ones too, only 1-5 of the most recent ones. This show will be released like any other. We just used this GOT theme for some promotions and to accompany the upcoming show of Bonnie Parker. The Promo on the 1st Post did not say anything about an exclusive card. It doesn't worth a reload ! Booster pack price 227 credits with my triple diamond and without the promised 20% if i sum each card individually it cost 122,65 credits minus the 20%... we have... 98,12 credits (My math are correct). Conclusion i'm out cause I don't like math error (and decimal numbers too XD), plus I have pre-ordered for this month and it was a worth it. Don't like this deal!!!! All the cards in ther first pack are ones i have no interest in!!!!! Personally, I prefer Coservative packs. @njarnb I'm so sorry... but I have my calculations done... I 0will not participate this friday... It doesn't worth a reload ! Booster pack price 227 credits with my triple diamond and without the promised 20% if i sum each card individually it cost 122,65 credits minus the 20%... we have... 98,12 credits (My math are correct).Conclusion i'm out cause I don't like math error (and decimal numbers too XD), plus I have pre-ordered for this month and it was a worth it. Community help...I have 220 Classic cards to go should I bite the bullit and just go for a complete collection or wait till possible promotion? I only have 1 TB left on 4 TB HDD so I can't decide what to do...Should I just Pokemon I Stripper? Side note I redownloaded all shows and it shows that there is one I own one but it doesn't show in collection is that because TOTEM lost rights to someone? With regards to the classic cards, I'm in the same boat as you (177 classic cards are all I'm missing). I have been tempted to buy the remaining ones but decided not to because once I had full collection (everything available these days, that is), it would make me, the "collector side" of me, more prone to buy every single release in the future even if I didn't really like the card... The gaps in the collection would be even more glaring and unwanted as they would be now. how do I get the Kaleesi card? Do I have to buy all of these eggs to get it? As a free user of iStripper, you are not allowed to answer a topic in the forum or to create a new topic. But you can still access basics categories and get in touch with our community !